The report provides a comparison of the latest medium-term projections for wheat, rice, coarse grains, oilseeds, vegetable oils and sugar made by five international institutions (OECD/FAO, USDA, FAPRI, and IGC) on the supply and demand conditions globally and for India. A standalone model for Indian agricultural markets, using the OECD/FAO developed COSIMO model and an econometric model developed by NCAER have been used for medium-term projections. 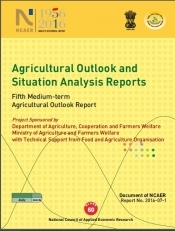 Realising the importance of the livestock sector in providing nutrition, better returns to farmers and as a means for diversification of Indian agriculture, a chapter on status and prospects of livestock sector is also covered in this report.